A few recently-unearthed letters have provided historians with a small glimpse into the personal life of former President Barack Obama during his college years. Emory University in Atlanta, Georgia, announced on Thursday that its Stuart A. Rose Manuscript, Archives and Rare Book Library had obtained nine handwritten letters Obama sent to his former girlfriend, Alexandra McNear, between the years of 1982 and 1984. According to the New York Times, the pair had met and started dating at Occidental College in Los Angeles before Obama transferred to Columbia University in New York City as a junior. In the first letter obtained by Emory, dated September 26, 1982, Obama wrote to McNear from a campus café, where he is was "drinking V8 juice and listening to a badly scratched opera being broadcast." The future president went on to describe his new school year, including how his favorite class so far was a physics course for non-mathematicians he was taking to fill a science requirement. Eventually, the letter becomes more metaphorical in nature, with Obama lamenting "how quickly the class lines are being drawn" with old friends stepping into roles that society has prescribed for them. "I trust you know that I miss you, that my concern for you is as wide as the air, my confidence in you as deep as the sea, my love rich and plentiful," he signed off. "Love, Barack." Although there is certainly a romantic element to parts of Obama's letters, Rosemary Magee, director of the Rose Library at Emory, believes the notes may provide more of a glimpse into the "search of a young man for meaning and identity" than into an intimate relationship. "What we learn about is a young man who is yet to become or even dream about becoming President Obama," Magee said. “It’s a story of a journey over a couple of years about a sense of self-understanding, self-definition and his understanding of himself and place in the world." "While intimate in a philosophical way, they reflect primarily a college student coming to terms with himself and others," she added. "These letters aren’t particularly personal," echoed Andra Gillespie, an associate professor of political science at Emory University. "You're coming in at these letters at a point in President Obama's and Alex McNear's relationship where you can see the arc of the breakup that’s going to happen. There's no breakup letter per se, but you can see there are a couple of post-breakup letters. "Their relationship, at the point that we’re reading it, is very intellectual and they're clearly struggling with each other," Gillespie added. "They're both trying to find themselves and they’re having tough intellectual conversations with each other." The letters will be on display on October 20 from 2 to 4 p.m. in the Woodruff Commons of the Rose Library at Emory. Barack Obama, graduate of Harvard Law School '91, is photographed on campus after was named head of the Harvard Law Review in 1990. Barack Obama poses in the office of The Harvard Law Review on Monday, Feb. 5, 1990, after being named President of The Harvard Law Review. Barack Obama, graduate of Harvard Law School 1991 yearbook photo. Newly-elected president & former community program dir. Barack Obama. US Democratic presidential candidate Senator Barack Obama (D-IL) is seen with his wife Michelle in a family snapshot from their October 18, 1992 wedding day released by Obama's US presidential campaign, February 4, 2008. Obama, now a 46-year-old first-term U.S. senator from Illinois who would be the first black US president if elected, heads into Super Tuesday's slate of 22 Democratic state primaries and caucuses in a tight race with Hillary Clinton to become the party's presidential nominee. Barack Obama, candidate for a Senate seat in Illinois and one of the keynote speakers of the 2004 Democratic National Convention, addresses delegates during the second night of the event at the FleetCenter in Boston, July 27, 2004. More than 4,000 delegates to the convention will nominate John Kerry on Wednesday to challenge President George W. Bush in a November battle for the White House that is essentially a dead heat. State Senator from Ill. and U.S. Senate Candidate Barack Obama keynote speaker Tuesday night at the DNC the second night. Barack Obama, Democratic candidate for the U.S. Senate from Illinois, smiles as he finishes up his sound check on the podium at the FleetCenter, site of the Democratic National Convention in Boston, July 27, 2004. Obama is the keynote speaker for the second night of the convention, which will also feature a speech by Teresa Heinz Kerry, wife of Democratic presidential candidate Senator John Kerry. Senate candidate Barack Obama, D-Il., the night before the Democratic National Convention 2004 in front of the Illinois delegation party at the Ye Olde Oyster House in Boston, Ma. Democratic Convention Keynote speaker and Illinois Senate candidate Barack Obama hugs a supporter before speaking at the League of Conservation Voters Environmental Victory Rally at Christopher Columbus Park July 27, 2004 in Boston, Massachusetts. Democratic presidential candidate U.S. Senator John Kerry (D-MA) is expected to accept his party's nomination later in the week. Democratic candidate for the U.S. Senate, Barack Obama speaks to the media September 15, 2004 in Chicago, Illinois. Obama unveiled his proposal to make college education more affordable and accessible to working families and their children. Democratic Senator Barack Obama drives from his home on December 8, 2004 in Chicago, Illinois. The Senator will give the keynote address at the Chicago Economic Club. US Senator Barack Obama (D-Illinois) and his wife Michelle after a swearing in ceremony on Capitol Hill in Washington DC. Obama, 43, is the only African-American in the Senate, and the fifth in its history. Academy awarding-winning actor George Clooney (C) smiles alongside Senator Barack Obama (R)(D-IL) and Senator Sam Brownback (R-KS) as he speaks about his recent visit to the Darfur region of Sudan at a Washington press conference April 27, 2006. Clooney and his father, journalist Nick Clooney, have just returned from a week-long trip to southern Sudan and eastern Chad where they met with dozens of individuals affected by the crisis and documented the brutal and worsening conflict in Sudan's Darfur region. Then-U.S. Senator Barack Obama, carrying his daughter Sasha and accompanied by William Lay (front R), leave the memorial park of the former United States Embassy, a target of an August 1998 bombing, in Kenya's capital Nairobi, in this file picture taken August 25, 2006. U.S. President Barack Obama, who last visited Kenya as a U.S. senator in 2006, is expected to arrive in Nairobi on July 24, 2015 for a three-day state visit. Senator Barack Obama, R, (D-IL) listens to proceedings during a Senate Rules Committee hearing on overhauling lobbying on Capitol Hill in Washington, February 8, 2006. Obama, along with Sen. John McCain (R-AZ), Sen. Norm Coleman (R-MN) and Sen. Russ Feingold (D-WI) offered their views on lobbying reform to the committee. Democratic presidential candidates U.S. Sen. Barack Obama (D-IL) (L) and U.S. Sen. Hillary Clinton (D-NY) (R) talk prior to the first debate of the 2008 presidential campaign April 26, 2007 at South Carolina State University in Orangeburg, South Carolina. The debate, featuring eight Democratic presidential candidates, comes 263 days before the first ballot will be cast in the Iowa caucus next January. Democratic Presidential Candidate Senator Barack Obama (D-IL) with his daughters Malia and Sasha and his wife Michelle vist the Iowa State Fair August 16, 2007 in Des Moines, Iowa. The fair runs until August 19th and is expected to draw about 1 million people. John Edwards also made a campaign stop at the fair today. Democratic presidential hopeful Sen Barack Obama of Illinois addresses a crowd of supporters at a campaign rally, June 24, 2007 at Sunset Station, in San Antonio, Texas. Backstage at the event Sen Obama was joined by Bruce Bowen of the NBA Champion San Antonio Spurs. Senator Barack Obama during a July 4th campaign stop with his daughter Sasha, 6, in Beaver Creek, Iowa. U.S. Democratic President-elect Senator Barack Obama (D-IL) (L) and his running mate, Vice-President-elect Sen. Joe Biden (D-DE) wave during their election night rally in Chicago November 4, 2008. US Democratic presidential nominee Senator Barack Obama (D-IL) and Senator Hillary Clinton (D-NY) wave to the crowd during a campaign rally in Orlando, Florida October 20, 2008. U.S. President-elect Barack Obama speaks to the media aboard a military plane at Chicago Midway Airport January 4, 2009 before flying to Andrews Air Force Base near Washington. Obama is moving to Washington 16 days before being sworn in as the 44th President of the United States on January 20. U.S. President Barack Obama and first lady Michelle Obama dance at the Home States Ball in Washington January 20, 2009. Obama took power as the first black U.S. president on Tuesday and quickly turned the page on the Bush years, urging Americans to rally to end the worst economic crisis in generations and repair the U.S. image abroad. Michelle Obama is wearing a custom-made dress by Taiwanese designer Jason Wu. U.S. President Barack Obama departs Andrews Air Force Base in Washington enroute to Copenhagen to promote Chicago's bid to host the 2016 Summer Olympic Games October 1, 2009. No incumbent U.S. President has ever addressed an IOC session before. Obama is trying to woo International Olympic Committee (IOC) members and is poised to make phone calls on his flight to Denmark to urge them to pick Chicago as host of the 2016 Summer Games. U.S. President Barack Obama smiles alongside German Chancellor Angela Merkel during their press conference at the Rathous (City Hall) in Baden-Baden, Germany, April 3, 2009. The North Atlantic Treaty Organisation (NATO) military alliance is celebrating its 60th anniversary this week at a summit co-hosted by Germany and France. U.S. President Barack Obama laughs during a news conference in the Brady Press Briefing Room of the White House in Washington, June 23, 2009. US President Barack Obama gestures toward the crowd after playing a round of golf at the Mid Pacific Country Club in Kailua, Hawaii, on December 31, 2009. The First Family is on vacation. U.S. President Barack Obama calls to congratulate new British Prime Minister David Cameron in the Oval Office of the White House May 11, 2010 in Washington, DC. Cameron, the Conservative leader, took over as prime minister after Gordon Brown resigned earlier. The Conservatives won support from the Liberal Democrats after they fell short of a majority in last weeks election. US President Barack Obama speaks with small business owners during a meeting at the Tastee Sub Shop in Edison, New Jersey, July 28, 2010. U.S. President Barack Obama smiles as he tours Skana Aluminum Company, an aluminum manufacturer, as part of his administration's White House to Main Street Tour in Manitowoc, Wisconsin, January 26, 2011. US President Barack Obama and Vice President Joe Biden walk to a ceremony to mark the return of the US Forces - Iraq colors December 20, 2011 at Andrews Air Force Base in Maryland. The event marks the end of the Iraq war after the last US combat troops rolled out of Iraq into Kuwait on December 18. U.S. President Barack Obama smiles as he delivers his State of the Union address on Capitol Hill in Washington, January 25, 2011. U.S. President Barack Obama challenged Republicans on Tuesday to adopt limited spending cuts and invest in new research and education to generate a job-creating "Sputnik moment" for America in a speech designed to revitalize his leadership. U.S. President Barack Obama shakes hands with House Speaker John Boehner, as U.S. Vice President Joe Biden looks on, upon arriving to address a joint session of Congress on Capitol Hill in Washington September 8, 2011. In this handout provided by the White House, President Barack Obama holds a child after delivering remarks on the American Jobs Act beneath the Clay Wade Bailey Bridge September 22, 2011 in Cincinnati, Ohio. 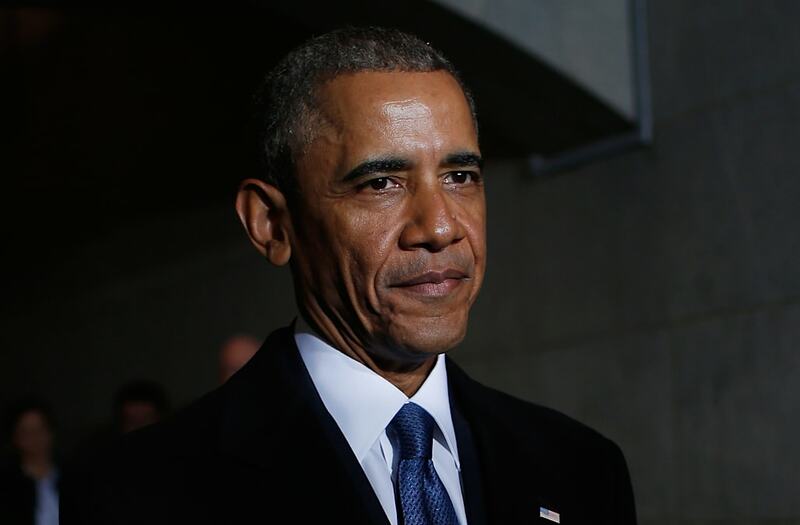 Obama appealed to U.S. Speaker of the House Rep. John Boehner (R-OH) and Senate Minority Leader Sen. Mitch McConnell (R-KY) to pass his jobs bill. U.S. President Barack Obama does push-ups while playing basketball during the 2012 White House Easter Egg Roll on the South Lawn in Washington April 9, 2012. U.S. President Barack Obama applauds retired U.S. Army Captain Florent Groberg, 32, after presenting him with the Medal of Honor during a ceremony at the White House in Washington November 12, 2015. Groberg received the Medal of Honor for his courageous actions while serving as a personal security detachment commander during combat operations in Kunar Province, Afghanistan on August 8, 2012. US President Barack Obama boards Air Force One on March 21, 2012 at Andrews Air Force Base in Maryland. Obama is headed to Nevada, New Mexico, Oklahoma and Ohio to highlight his energy policy. US President Barack Obama makes his way to board Air Force One July 19, 2012 before departure from Andrews Air Force Base in Maryland. Obama was headed to the state of Florida for two days of campaigning. U.S. President Barack Obama signs a series of executive orders about the administration's new gun law proposals as children who wrote letters to the White House about gun violence, (L-R) Hinna Zeejah, Taejah Goode, Julia Stokes and Grant Fritz, look on in the Eisenhower Executive Office building, on January 16, 2012 in Washington, DC. One month after a massacre that left 20 school children and 6 adults dead in Newtown, Connecticut, the president unveiled a package of gun control proposals that include universal background checks and bans on assault weapons and high-capacity magazines. U.S. President Barack Obama reacts after missing a putt on the first green at the Farm Neck Golf Club at Oak Bluffs on Marthas Vineyard, August 11, 2013. U.S. President Barack Obama poses with player David Ortiz for a "selfie" as he welcomes the 2013 World Series Champion Boston Red Sox to the South Lawn of the White House in Washington, April 1, 2014. President Barack Obama attends a hurricane preparedness meeting at FEMA Headquarters May 30, 2014 in Washington, DC. US President Barack Obama greets a young child dressed as the Pope and riding in a 'Popemobile' as he hands out treats to children trick-or-treating for Halloween on the South Lawn of the White House in Washington, DC, October 30, 2015. United States President Barack Obama, along with daughters Sasha (L) and Malia (R), attend the 68th annual pardoning of Thanksgiving turkey Abe in the Rose Garden of the White House in Washington November 25, 2015. U.S. President Barack Obama participates in a "Get Out the Early Vote" campaign event for Hillary Clinton in Columbus, Ohio, U.S. November 1, 2016. President Barack Obama reacts to a shot during the 2016 White House Easter Egg Roll on March 28, 2016 in Washington, DC. NOTE TO USER: User expressly acknowledges and agrees that, by downloading and or using this photograph, User is consenting to the terms and conditions of the Getty Images License Agreement. President Barack Obama waves as he exits The White House before boarding Marine One on November 6, 2016 in Washington, DC. President Obama will travel to Orlando to campaign from Democratic Presidential Candidate Hillary Clinton. Britain's Queen Elizabeth and Prince Philip welcome U.S President Barrack Obama and First Lady Michelle Obama on their arrival at Windsor Castle for a private lunch, in Windsor, Britain, April 22, 2016. U.S. President Barack Obama puffs out his cheeks at a baby as he greets people in the crowd after his remarks at a Hillary for America campaign event at the Fayetteville State University in Fayetteville, North Carolina, U.S. November 4, 2016. President Obama departs Marine One and walks toward the Oval Office after visiting wounded service members at Walter Reed National Military Medical Center in Bethesda at White House on August 26, 2016 in Washington, DC. U.S. President Barack Obama and first lady Michelle Obama pose with Britain's Prince William, his wife Catherine, Duchess of Cambridge, and Prince Harry, upon arrival for dinner at Kensington Palace in London, Britain April 22, 2016. Golden State Warriors players Draymond Green (L) and Stephen Curry (R) flank U.S. President Barack Obama who holds up a jersey given to him at an event honoring the 2015 NBA basketball champions at the White House in Washington February 4, 2016. US President Barack Obama speaks during his farewell address in Chicago, Illinois on January 10, 2017. Barack Obama closes the book on his presidency, with a farewell speech in Chicago that will try to lift supporters shaken by Donald Trump's shock election. U.S. President Barack Obama embarks on Air Force One in sub-freezing weather as he departs Joint Base Andrews, Maryland, for the wedding of a White House staffer in Jacksonville, Florida, January 7, 2017. U.S. President Barack Obama waves as he leaves the White House during his departure for Chicago, Illinois, in Washington, U.S. January 10, 2017.